A new project funded through the National Science Foundation (NSF) Macrosystems Biology program is testing patterns and mechanisms of scaling across North America and at an additional site in Australia. The SCALER—or Scale, Consumers And Lotic Ecosystem Rates—project is an ambitious collaborative research project that addresses one of the biggest questions in ecology: Can measurements and the results of experiments carried out at small spatial scales be applied to scales relevant to landscape function and ecosystem management? 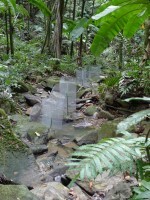 SCALER experiments are currently being conducted at five Long Term Ecological Research (LTER) sites across the country--at Coweeta (CWT), Luquillo (LUQ), Konza (KNZ), Toolik (ARC) and Bonanza Creek (BNZ) LTER sites--and Litchfield National Park in northern Australia near Charles Darwin University. The SCALER experiment was conceived in 2006 to provide preliminary data to inform the development of the Stream Experimental and Observational Network (STREON), which is part of the National Ecological Observatory Network (NEON) initiative. We are investigating how small-scale ecological experiments in streams can be used to understand the ecological structure and function of river networks. More specifically, we are asking whether basic resources, the structure of the community that’s consuming those resources, and the associated ecosystem processes measured at the scale of centimeters to 100 meters can be used to successfully predict these variables throughout a drainage network. We examine these patterns of scaling within and across regions, conducting research across an array of North American streams ranging from tropical forest to arctic tundra and an additional site in the wet-dry tropics of Australia. In the experiment, we are measuring in-stream photosynthesis, respiration, and ammonium uptake rates at two different scales of measurement at each research site and manipulating the densities of consumers at both scales in a subset of sites. The smallest scale is the “patch”, about 300 square centimeters--the scale at which questions related to biogeochemistry and consumer effects can be tested at all sites. Effects of the STREON consumer experiment will also be measured at the patch scale. The intermediate scale is the “reach”, comprising tens of meters of stream length and hundreds of square meters of streambed. At this scale we can measure stream metabolism (photosynthesis and respiration) and nutrient (ammonium) uptake directly, for comparison to the smaller-scale patch measurements. In KNZ and Australia, stream conditions enable reach-scale consumer manipulations. One goal of our project is to extrapolate results from the patch to the reach scale at ambient consumer densities, as well as under reduced consumer numbers, using the simplest functions and models possible. The largest experimental scale at which we work is the watershed of a river network. To address this largest scale, we will model processes throughout the stream network based on functional relationships of process rates and key drivers (light, temperature, flow) developed from reach-scale measurements spread throughout each stream network. We will use functional, process-based models to predict process rates at any point in the entire network and then aggregate these rates to provide estimates of processes at network scales (e.g. metabolism of an entire river network). We will then compare the model predictions and synoptic data to determine whether accurate scaling of rates to entire river networks does or does not occur. Currently, we predict that estimates of processes at the network scale will not be a simple additive function of those derived from reach- or patch-scale measurements. However, we expect that variables for which we cannot currently account and linkages within the network will all need to be considered to accurately portray the network scale. The project is a collaborative effort involving investigators from nine institutions. Upon receiving funding, several planning meetings were held to develop detailed standard operating procedures used at all sites. Two postdoctoral researchers (one field-based, one modeling-based) trained team members at all sites on these procedures and ensured that sufficient data were collected for modeling needs. The scientists meet regularly during the project to refine and reorganize the experimental approaches, with frequent video conferences among interest-specific sub groups (including a graduate student group) to plan experimental and modeling approaches. In addition to providing easily accessible data for synthesis within the SCALER group, we will make our data widely available to the public. The group is currently coordinating with the LTER Network Office and ultimately NEON to ensure that our data streams are compatible with these larger science networks.